About the author: Major General Basilio J. Valdes, M.D. (July 10, 1892 –January 26, 1970). Attended La Salle College, Barcelona (1897-1901); San Beda College, (1901-1903); La Salle College Hongkong (1903-1904); American School, Manila (1904); Pagsanjan High School ( 1905-1908); Manila High School (1908-1911); and Faculty of Medicine and Surgery, University of Santo Tomas (1911-1916), graduating meritissimus. Graduate of the Command and General Staff School at Forth Leavenworth, Kansas in 1943. Doctor of Science (honoris causa) from Parsons College, U.S.A. Member of the Philippine Medical Association; University of Santo Tomas Medical Society; Association of Military Surgeons of the Philippines; Association of Military Surgeons of the United States; Philippine Federation of Private Medical Practitioners; Veterans of Bataan and Corregidor; President of the War Veterans of the Philippines, Inc.; Vice-President of the Philippine Tuberculosis Society; member of the Philippine Cancer Society, Manila Lions Club; fellow and past President, Philippine College of Surgeons, Fellow and past President, Philippine Chapter of the International College of Surgeons; and Fellow of the Philippine Orthopedic Association. In the First World War, volunteered to serve in France, appointed Chief Surgeon of the Anglo-French Military Hospital. Instructor for Physiology at the College of Medicine, U.S.T. (1916); Medical Inspector, Philippine Constabulary (1926-1934); Acting Commissioner of Health and Welfare 1932-1934); member of the Board of Medical Examiners (1924-1928) and Chairman, Board of Medical Examiners (1928-1932). 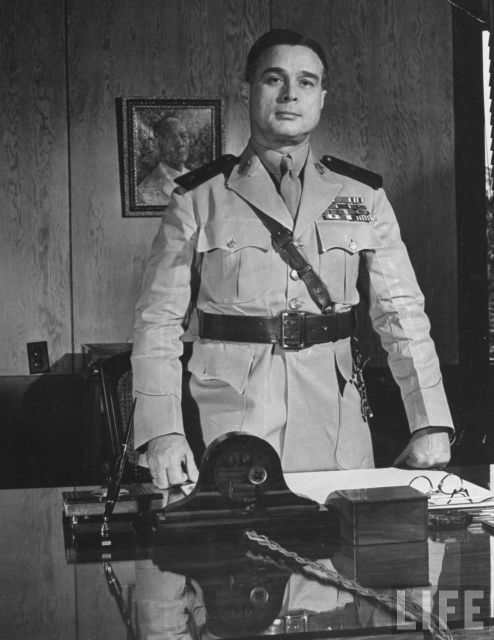 Chief of Staff, Philippine Army, 1939-1945. Secretary of National Defense in the Quezon and Osmeña War Cabinets, 1941-45. Professor of Surgery at the University of Santo Tomas (UST), Medical Director of Our Lady of Lourdes Hospital, 1948-1970. Chairman of the Deans Committee, Veterans Memorial Hospital and President of the Hacienda del Carmen, Inc.
About the diary: The diary entries published here originally came from a soft copy of selected (and edited) diary entries provided by the family of Gen. Valdes to researchers and historians. In March 2015, Mrs. Rosario Ugarte, granddaughter of Gen. Valdes, provided the original diaries for digitization by the Presidential Museum and Library and gave permission for the digital copies to be posted here in the Philippine Diary Project, in full, and without deletions. We are grateful to her and her family for allowing this. The entries reproduced here mainly cover his period of service in the Quezon and Osmeña administrations, but also include some postwar years. Readers are urged to read The Zero Hour: The Personal War of Basilio J. Valdes by Ruel S. de Vera. Bookmark, Makati City, 2001. ISBN 971-569-415-2.